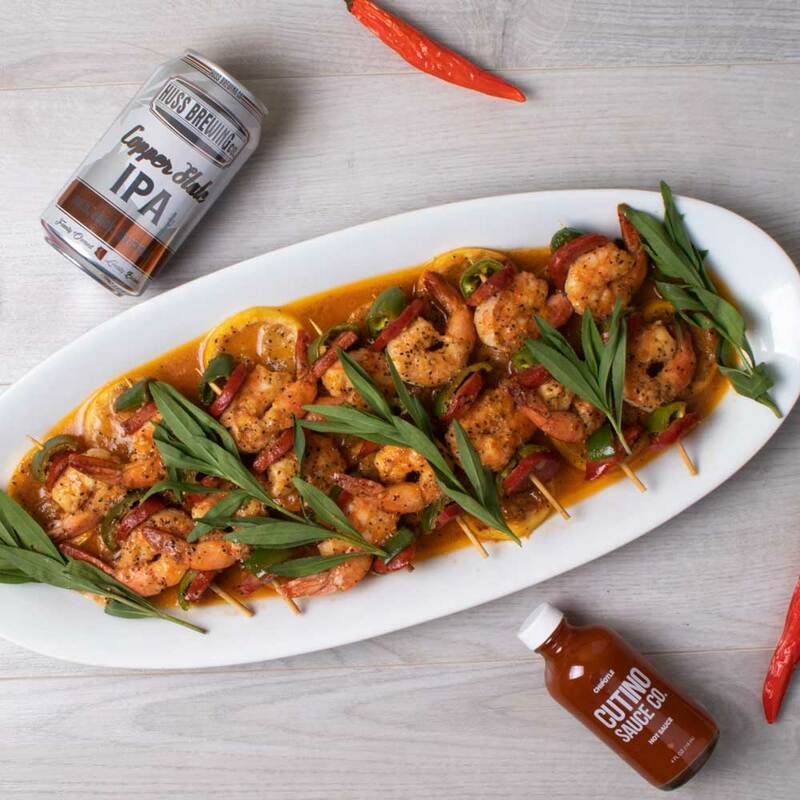 IPA Chipotle Shrimp Skewers - Cutino Sauce Co.
1. Thinly slice lemons and lay in a single layer covering a full baking sheet. 2. In a small saucepan melt butter, add beer & hot sauce, and simmer on low for 10 minutes and let cool. 3. Build skewers by alternating sausage, jalapeños, and shrimp. Repeat with all skewers until they are full. 4. Pre heat oven to 425F. Lay skewers iin rows on top of the lemons. Sprinkle both sides liberally with lemon pepper seasoning. 5. Pour half of the cooled sauce over the skewers, covering evenly. Bake for 8 minutes, carefully remove from the oven, flip skewers then apply the remaining sauce. Bake for another 7 minutes. 6. Remove skewers from the baking sheet and reserve the sauce. On a serving dish layout the cooked lemon evenly. Top with skewers and pour reserved sauce over the skewers. Garnish with fresh herbs.